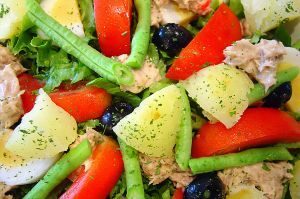 This healthy tuna salad recipe combines a host of tasty fresh ingredients and is made better with the extra kick of lemon. Make sure to use good quality canned tuna from a sustainable source and enjoy. Serves four. Add the canned tuna to a mixing bowl and use a fork to break it up into small pieces. Add the olives, lemon juice, lemon zest & parsley. Stir to combine. Add the tomatoes, eggs and green beans. Pour in the olive oil, along with a sprinkle of salt & pepper. Toss well & serve.